I’ve been stamping about 18 yrs. I have several techniques I like to work with: stippling, sponging and scenic stamping. My overall favorite though is definitely stippling since you can get so many different looks using the stipple brush. It pretty much depends on what images I’m working with, however, I do love black/red or black/anything combinations; earth tones for scenic stamping; and soft spring colors when working with florals. I am usually challenged using bright colors for some reason. Take my stipple brush away and I will be lost! If you want to be published, submit submit submit. Also don’t ever think you’ve already learned everything there is to stamping, scrapbooking, cardmaking, crafting, etc because there is always something new to learn. I’ve always loved oriental themes & images. I seem to find a lot of beauty and tranquility in them. Also when it comes to coloring oriental images, it always seems easy to color them or find a way to just leave them stamped as is. Lately, I’ve started trying my hand at mixing/matching oriental images with non-traditional oriental images to see what I can do with them. Some of the results I have liked and some have ended up in my recycle bin. RubberStampMadness (RSM), Take Ten, Paper Crafts because of the different stamping styles I’ve seen in them. Occasionally I’ll pick up one of the British stamping magazines to see some of the different styles from across the pond and what I can learn from them. These are all non oriental themes, however: RSM – Fall 2013, RSM – Spring 2013, RSM – Holidays 2012, RubberStamper July/Aug 2004, RubberStamper Oct 2003, Stampers Sampler 3-4yrs ago (can’t remember exactly or find issue), RSM – Aug 2013 Facebook page, RSM – notified of future publication in Holiday 2013 edition. I also scrapbook which has been sorely lacking lately and make some home decor items for gifts (birthdays, Christmas, anniversaries) for my family. For my scenic stamping, I’m inspired by Thomas Kincade paintings and I’m fortunate to have a friend who sent me a book of them before Mr. Kincade passed away. Also, I live only 2hrs west of Yosemite National Park and have been fortunate enough to be able to visit there many times (pictures of course) over the years as well as Yosemite’s famous Tioga Pass. 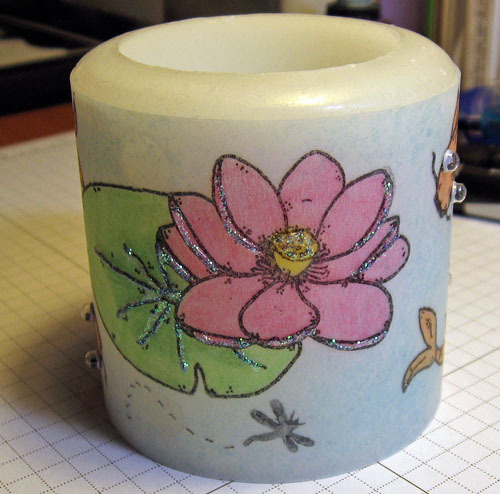 As far as oriental stamping inspiration is concerned, I am also fortunate to live only 2.5 hrs south of San Francisco’s famous China Town and have been there a couple of times – my son and his girlfriend have been there as well as Japan Town more. However, since I am so close to San Francisco, whenever there is a big celebration and the ornate dragons are pulled out for parades, etc, the news here carries parts of the parade with pics later posted online so I can see the colors, and hear, the sounds of the parade. I wish I could say I have some sort of art background, but nope, not at all unless you count watching/learning from my very talented mother. She not only decorated cakes, but did all of the silk floral arrangements for my wedding and taught me to paint as well. We used to work on ceramics together years ago before she passed away from breast cancer. In fact, I still have the ceramic nativity set she inspired me to paint after she made one for our church complete with hand made wooden stable. Unfortunately I am not working anymore due to my chronic migraines. Before I had to stop working, I used to be a radiology scheduler for the local hospital here in town. Translation: I scheduled outpatient X-ray exams, inpatient xray exams, and biopsies/angiograms/heart caths as well as tracked down any comparison films for the radiologists or any necessary blood work for the special procedures. It was a high stress job and my stamping was my way to relax at the end of a long, long day. In fact, everyone who’s ever had my job has also had migraines. I am married to my husband of 23 yrs as of Dec 29th, Ken, and we have 2 children; John (21) in college and Sarah (16) a senior in high school this year. We also have several 4-legged fur babies (dog & cats) that try to help mommy stamp, or at least look over my shoulder, from time to time. The only fur baby that doesn’t want to be bothered with stamping is the dog, Bella, who just plops down by my feet sleeping so I trip on her whenever I get up. All of us currently live in Merced right in the middle of California’s fertile Central Valley. 1. Using drill press, or other means, hollow out the center of the candle deep enough for a battery operated votive to be placed inside just below the rim. 2. 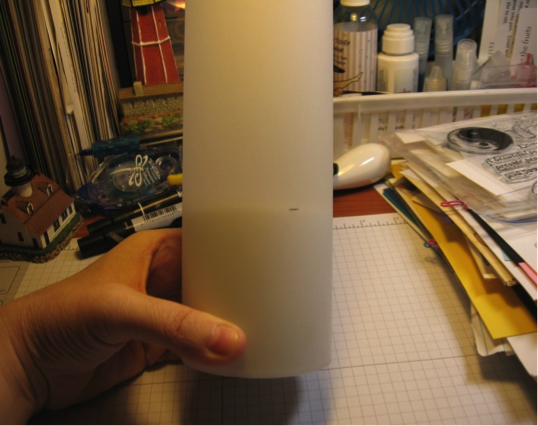 Take vellum card stock and wrap it around the candle. 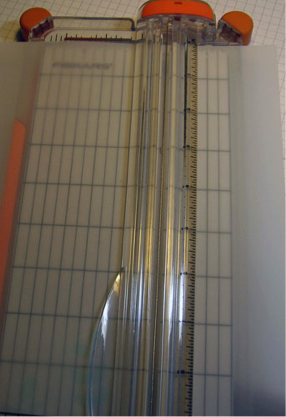 Then place a tic with a pencil just below the top of the rim. 3. Next, cut the vellum card stock down to size length wise. 4. Stamp images in memento tuxedo black ink, allow to dry – overnight is best. You may speed up the drying time by using an embossing gun, just make sure not to burn the vellum. 5. Flip stamped vellum image over, and on backside color using varying shades of Rose Art colored pencils as desired. 6. Once coloring is finished, add in dragonfly flight lines using a black marker and allow to dry. 7. Stipple Tim Holtz tumbled glass distress ink for the “pond” and allow to dry. 8. Wrap around candle and attach using glue dots. Add googlie eyes to koi fish using micro glue dots then ice stickles to lotus flowers and lily pads – allowing to dry. Place battery operated votive inside. Congratulations Bonnie on becoming StampArtistoftheMonth October. Enjoy you month of fame. Awesome project and it is so nice to learn more about you and your family. Enjoy your month in the spotlight, it is a well deserved honor. Bonnie, congratulations on being our October Stamp Artist of the Month!!! Loved reading your bio and learning more about you. . .and your project is awesome!!! Enjoy your month in the limelight!! Congrats Bonnie! It is nice to learn more about you and what inspires your stamping. Love your beautiful candle project! Thank you for the awesome comments and kudos. congratulations, Bonnie. Well deserved recognition. Congratulations Bonnie on becoming this months SAM! Love, love, love your candle idea….so pretty and the googly eyes…great fun! Great to read your bio, very interesting! Enjoy your month as SAM! Thanks, Barb, Anne, and Wendy.